SALES | Synconics Technologies Pvt. Ltd.
and timely invoicing for payment. Quotation Builder: Create a polished quote in seconds. Use predefined products, price lists, and templates to help your sales people work more efficiently. Quotation Template: Design custom quotation templates in just a few clicks and reuse them to save time. Let your customers help themselves with Customer Portal: Provide customers with access to an online portal to view their quotes, sales orders, and track the status of delivery orders in real-time. Save time and use eSign to easily get signatures on NDAs, contracts, or any PDF document. Incoterms: Configure Sales to automatically display Incoterms directly on the invoice. 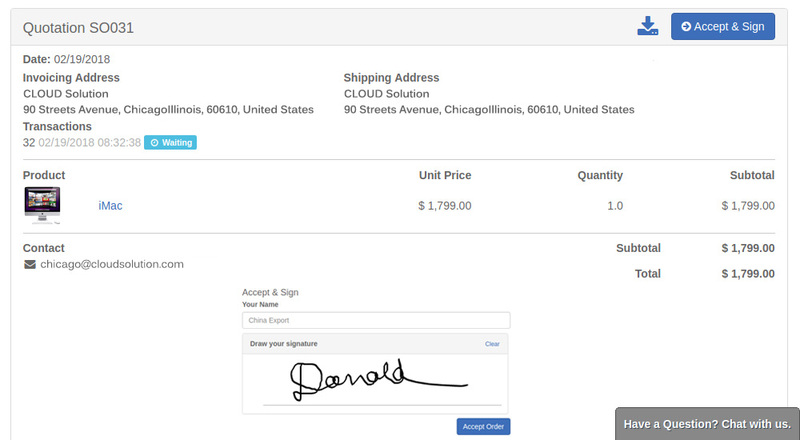 Sales Orders: Convert quotations into sales orders in one click or, let your customers do it themselves with online quotes and eSign. Save time with the ability to modify sales orders, sell product kits, and ship partial orders. 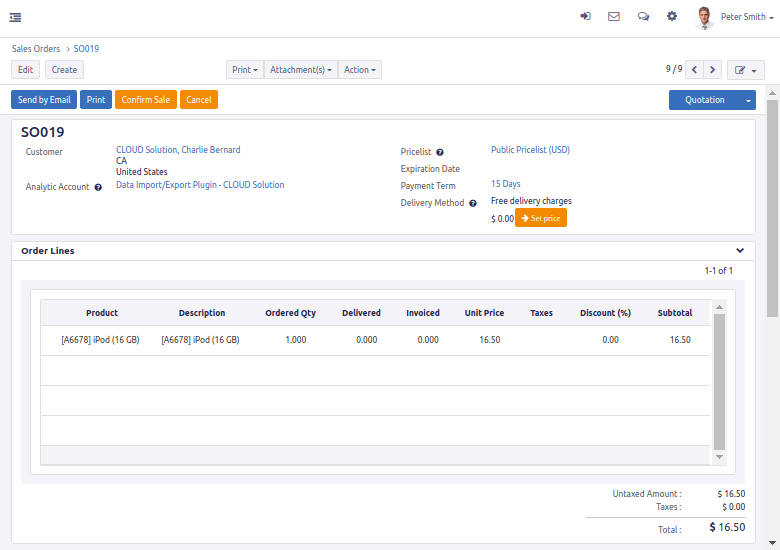 Manage Invoicing from Sales Orders: Invoice on ordered or delivered quantities. Manage payment terms by customer or by invoice. Easily track and follow up on invoice aging. Time & Material Contracts: Invoice any type of product or service with invoicing based on time and materials. 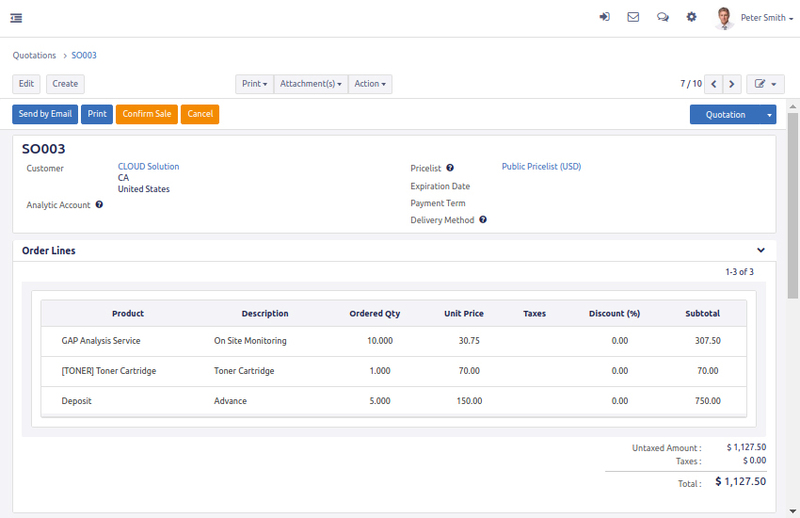 Easily record contracts and track each phase of a contract such as invoicing, renewal, and upselling. Fully integrated with Subscriptions Module for managing recurring invoices such as memberships or service contracts. Recurring Contract Invoices: Manage recurring billing, contract renewal alerts, and contract options as well as track recurring revenue via the MRR dashboard. Product Variants: Create and configure products with multiple options or variants such as size, color, finish, etc. Discounts: Apply discounts on any line item and choose how the price is reduced as well as if the discount is visible or hidden. Product Types: Manage any type of product including services, stockable products, delivery charges, electronic products, or consumables. Price lists: Use pricelist rules to compute the correct price based on customer conditions. Easily add one or more pricelists to individual products depending on each customer's segment, especially helpful for differentiating vendors. Automatically use the applicable pricelist based on conditions such as quantity ordered and/or time the product was ordered. Coupons: Create a custom coupon code for a pricelist and allow your customers to activate their discount at purchase. Convince customers to buy more with discounts and coupons. Upselling: Quotations are optimized to help your company sell more by proposing extra options, additional products, applying closing triggers, discounts, etc. Electronic Signature: Sell faster with electronic signatures, allowing your customers to review and sign your quotations online. Modern User Interface: All the information you need, where you need it with a fast and intuitive user interface designed for salespeople. Reduce Data Entry: Send quotes in a just a few clicks. 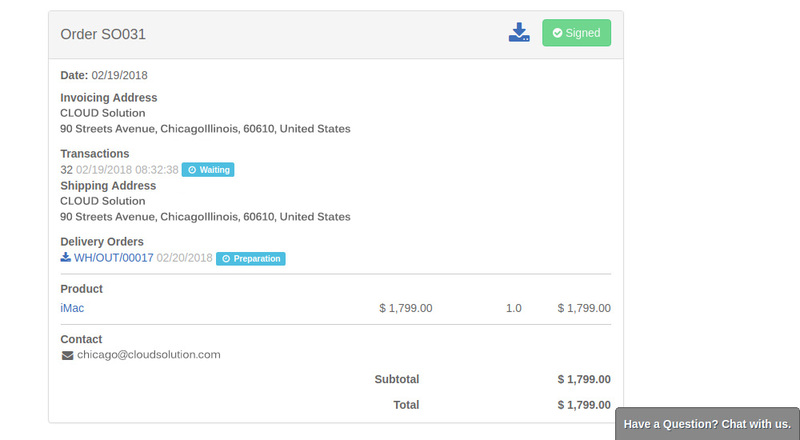 Convert quotes to sales orders and invoices from the same screen. 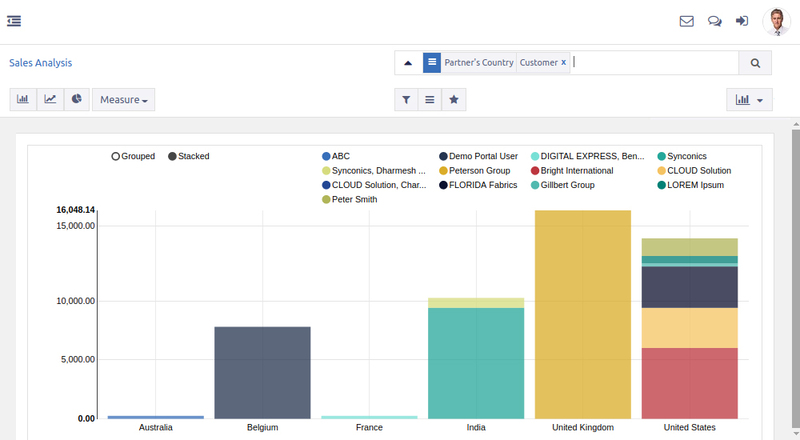 Integrates with the CRM app to manage your sales pipeline from qualification to close. Custom Alerts: Follow key quotations and orders in just a click and get alerts based on relevant activities. Email Gateways: See all of your email communications automatically attached to the associated customer order, allowing you to trace back on discussions and negotiate more efficiently. On-Boarding Emails: Create email templates for specific products to provide relevant information to buyers such as instructions, service reminders, etc. Multi-Company Rules: Automatically mirror sales and purchase orders in a multi-company setup. Sales Dashboard: Get a full overview of all your sales activities, next actions and performance data. Trackable KPIs: Easily monitor a KPI dashboard for important information such churn, MRR, lifetime value, CAC Ratio, upgrades/downgrades, etc. 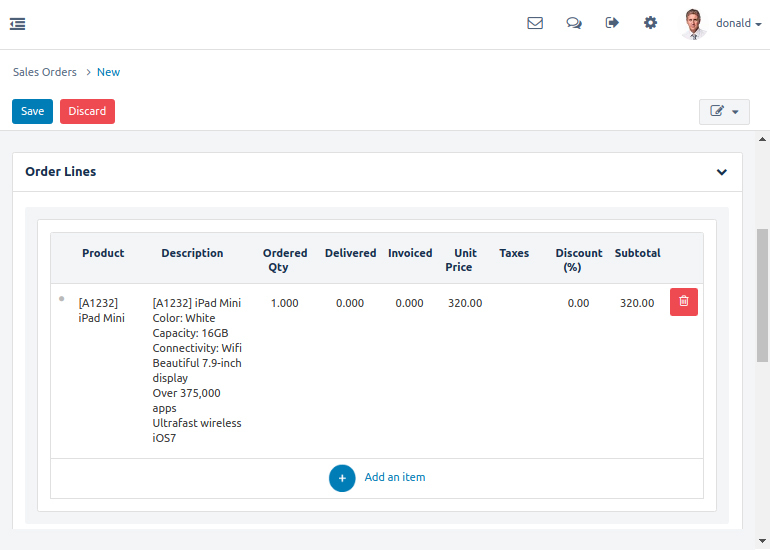 Order & Invoicing Analysis: Choose whether your statistics are based on orders, invoices or both. Group sales by any category such as product type, salesperson, country and sales team.